Ninja Spirit, known in Japan as Saigo no Nindou: Ninja Spirit (最後の忍道), is a 1988 platform action arcade game developed and published by Irem. The plot of Ninja Spirit is based on the quest of his revenge in feudal Japan. The game's hero is a young ninja who lost his father to a mysterious half-man half-beast creature. There are a total of seven stages varying from woodlands, wastelands, swamps, temples and cliffs. Each stage begins with the player slashing his way to the end, until he confronts a boss. The ninja is always armed with the sword Righteous Cloud which can be fluidly used to attack in all directions. Extra weapons include the Swirling Leaf (shurikens), the Bamboo Thunder (bombs), and the Rising Dragon (kusarigama). There are also several powerup items, such as one unleashing multiple ninja ghosts to assist the player. The game was successfully ported onto multiple platforms, with the TurboGrafx-16 format being the most popular (in this version there were two styles of mode: the PC engine mode which provides a lengthy healthbar, and the Arcade mode, which is a more challenging mode where the ninja dies with the slightest contact). On May 14, 2007, this game was ported to the Nintendo Wii's Virtual Console. Ninja Spirit later appeared in the Japan-only Game Boy title, Shuyaku Sentai Irem Fighter along with other characters from the game, as well as characters from three other Irem franchises: R-Type, Mr. Heli and Hammerin' Harry. 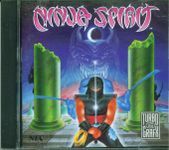 Ninja Spirit for the Turbografx-16 was also the first game in history to receive a 10 in Electronic Gaming Monthly. The game however did not have a large fanbase at the time. It was mainly overshadowed by the similar but more popular franchises like Ninja Gaiden and Shinobi. The solid gameplay did hold its own, but the lack of an in-depth story, spin-off, or sequel prevented it from expanding to the next generation of systems. Source: Wikipedia, "Ninja Spirit", available under the CC-BY-SA License.